For many students, this might be the first air travel.Hey!! there are many first times!! This page gives a simplified procedure for flight booking. In fact, booking the flight online is as simple as booking a bus or a train. Let's get booking. Decide the date of your journey. Typically you would want to land a week before your (orientation) classes begin. Pick a day between Monday and Friday, your flight fare will be cheaper. Wednesdays are the generally the cheapest day to travel. Search online, ask friends or in facebook groups about the best available flight deals which have highest baggage allowance for students. e.g. Qatar msinpoland offer allows one additional check-in bag (40 kg) for students traveling to Poland. Make sure your credit card or bank account has sufficient funds. Check with your university about the airport pickup service. Confirm that this service is avilable on the date and time of your arrival. Step I: Assuming that you don't have any prefered deal, go to this website - Qatar Airways. Select all the options highlighted below. Under the Show flexible dates tab, select Exact dates ±3 days. Step II: Now you will get a list of available dates and flights. The cheapest fares will be marked in green. Step III: Click on the green colored fare or scroll down, you will find your cheapest flight on the list. Click on show more to see the details of the flight. Step IV: Now if all the details are acceptable, note down the date, time and flight numbers.Search in other website to see the fares from different websites. Step V: Now you can choose to book from the original airline's website or from the third party website. Select the one you prefer. Step VII: If you proceed further, you will be asked to fill in the passenger details. You may also be asked to enter the Passport number. Step VIII: Now you can reserve the seat but at an additional cost. Choose No Thanks, continue to payment. You will have the option to choose left over seats while checking in online. Step IX: Now you can verify the summary of your booking and complete your payment. Step X: Once you complete the payment, you will get a confirmation email which contains the payment receipt and your flight details. Later you will also get your flight ticket via email. 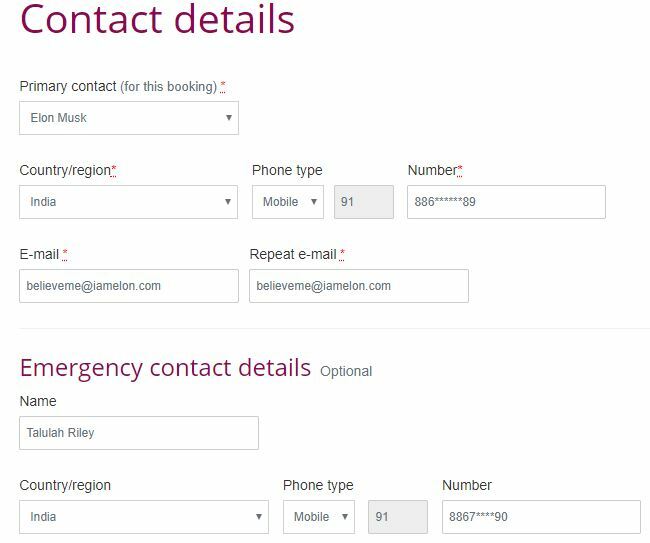 Step XI: You will have your own booking reference number with which you can access the online portal (link to this will be in the mail you received). You can change things like your phone number, baggage allowance etc. You can also reschedule and cancel your flight using this online portal. Step XII: Online check-in will be open 24 hours before the scheduled flight departure. You can check-in online (enter details like Passport number etc. and confirm your seat number and baggage) to save some time at the airport. Book the flight as early as possible. If possible, book the flight with a friend or two. If this is your first-time flight travel, it is quite natural to feel anxiousness and excitement at the same time. Also, since you are traveling to a foreign land, having a friend alongside should help reduce your anxiety. Always pick the best baggage allowance over the flight fare for your first time. You would want to carry all you can to support yourself for at least a year. You can only avail the student offer for flight booking this one time. So take full advantage of it. Next time you travel, you will have a German National Visa, not a Student Visa. If you think that there is a possibility of rescheduling or canceling the flight, it is a good idea to book your flight on the respective airline's website rather than a third party website. It is going to be a bit of hassle with third party websites to reschedule or to get your refund, whereas the process will be pretty straightforward with original airline's website. Here's an interesting fact. There's an advantage with searching for flights in incognito or private browsing mode to see the lowest prices. Based on the cookies in your browser, flight prices do increase when a particular route is repeatedly searched.